Using the “supa klever” form of marketing math, a switching fabric is actually 360 GB/s but because it goes in at 360Gb/s and out at 360Gb/s and therefore you could count it twice. So that is seven hundred and twenty gigabits. That’s the number. In fact, the switching fabric is eighteen inputs of 20Gb/s per input. 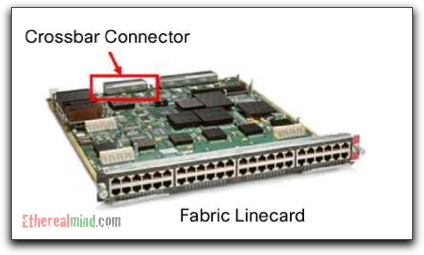 Of these, the backplane in your Catalyst 6500 will decide how many are presented to your line cards. 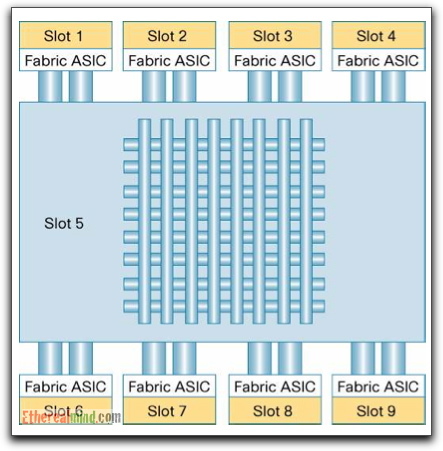 The C6503, C6506 and C6509 will present dual fabric connections while the C6513 is dependent on slot. Each slot in the backplane of the C6509-E chassis has two 20Gb/s backplane connections. There are nine slots. Nine slots at 40Gb/s is 360GB/s. Note that backplane slots on a 6513 do not support dual 20Gb/s on all slots. Because the switching fabric on the Supervisor has eighteen 20Gb/s inputs, you must layout the inputs differently. Therefore the slots at the top of 6513 are only 20GB/s and not 40Gb/s. This is what makes the C6513 signficantly different from the C6509 chassis. The 6513 was a popular choice when low performance line cards were used, but today, high density gigabit ethernet is common and much increased bandwidth of servers and desktops †means the C6513 is not commonly used, especially for data centres.
? 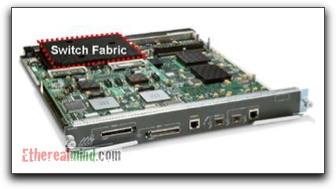 WS-X6708-10GE: an 8 port 10 Gigabit Ethernet X2 optic based line card supporting 2 x 20 Gbps fabric channels to the Supervisor Engine 720 crossbar switch fabric with integrated Distributed Forwarding Card 3CXL.Not this card has 80 Gb/s of input (in one direction, 160 Gb/s in two directions) and could easily oversubscribe the backplane connection and switch fabric connection on those inputs. 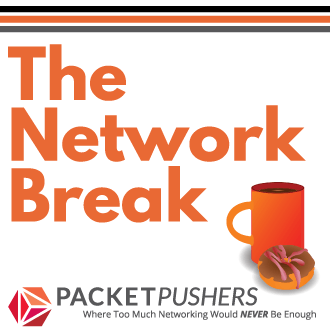 An oversubscribed card means that packets may be delayed or dropped under heavy loads. You can easily tell if the blade has some form of connection to the Cross Bar fabric by looking at the connectors on the back of the cards. 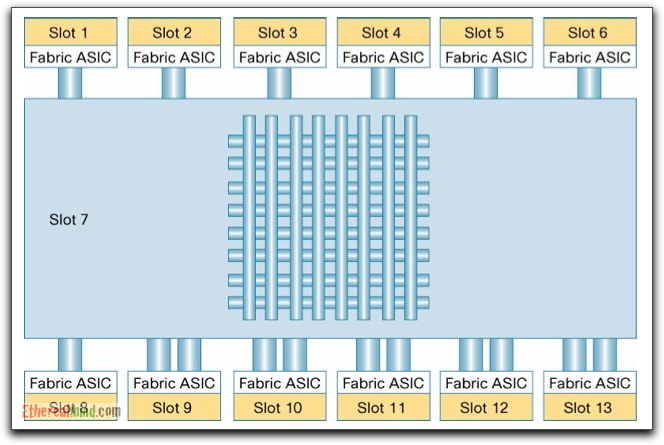 If the Cross Bar Connector is present, then the module has some form of the connection to the fabric. 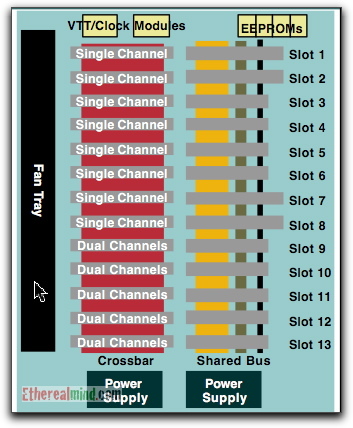 There is also a Shared Bus on the C6500 that operates at 32Gb/s (yes, 16Gb/s in both directions). This is what was used in the early days of the chassis with the first generation C61xx and C63xx modules which could easily oversubscribe the backplane connection. Most new installation are completely fabric switched (excepting for IP Telephony installations who use the oversubscribed model and like the QoS features of the C6500 and the high power density of up to 8500W in a single chassis). This post is not a comprehensive look at the modules and supervisor architecture. This is covered a number of documents but check the White paper link just below this which has a lot more information and is a complete reference to the architecture of the C6500. The reason for this article is to outline some of the issues that a Data Centre designer needs to understand. The architecture of the switch, and same logic applies to storage switches, can impact the design of the network. The decision on whether to purchase a WS-X6704-10GE or WS-X6708-10GE can be impacted by the predicted traffic load. 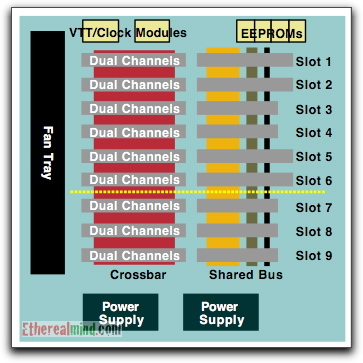 There are other factors that might affect a design, such as the Multicast performance or the QoS features, but this article points out some of the first factors for thinking about whether C6500 is the right switch. I hope you realise that knowing something about the guts of your switch, and how the insides look, is important to getting your network right. 1) Some images and concepts are drawn from the CISCO CATALYST 6500 SWITCH ARCHITECTURE SESSION RST-4501 from Cisco Networkers in 2004. Clear and to the point. Nice article!! Cisco was less forthcoming about this or at least on this level of detail when we built out our Phoenix location. Like you said in your observations, this does “outline some of the issues that a Data Centre designer needs to understand” and is what drove us over to Juniper for Phoenix. Thank you! Very clear and illustrative 😉 I’m assuming when you talk about 20 Gbps connections, they are really 10 Gbps (in+out)? Since they sell 4x10GE line card as not oversubscribed, I can only assume it’s 20+20. I always had a dislike for the stating of bandwidth as the sum of input and output. Yes, the port/interface/module/yourmama can handle that much traffic at once, but, in a lot of situations, I’m only interested in sending traffic from A to B, so I only care about one direction for the most part. every time i have had conversations with people about 6513s, I always tell them to avoid it like the plague. Of the dozens I have encountered it has always been to remove them in place of 6509s or 6506s so that any card could go anywhere. 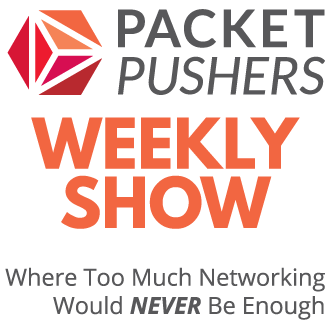 So many customers are sold on the density but don’t realize the limitations. Cisco shouldn’t even sell this atrocity, they have been talking about fixing it for years but with the nexus 7ks it will never happen. At least the 7010 and 7018 have the same capacity in every slot. As I remember, The C6513 was a popular choice in the early days of IP Telephony (now Unified Communications) because you needed slots for DSP banks for Transcoding and Gateways function as well as a lot of WS-X6148 modules for high density floors. At that time, the 256Gbps Fabric was new and exciting and the WS-C65xx modules were very expensive. Since the WS-65xx could only use one backplane channel at 8Gbps, the C6513 backplane looked like a good idea at the time. That’s the way the marketing moves sometimes. If you give the customers what they ask for, you might regret it later. It’s a great to know about how cisco catalyst works, but it would have been better if you have explained for what and why it is used. You forgot to mention that 40Gbps per slot is the Half-Duplex speed. Its Full-Duplex speed is 80Gbps 40Gbps in + 40Gbps out of the slot. That means the sup720 is 360Gbps + 360Gbps or 720Gbps. Also the Sup2T supports 80Gbps per slot and supports dual channel on every slot in the 6513. That Half-Duplex on the slot again for a total of 160Gbps per slot or 2080Gbps where they get the 2T. Why the marketing folks list the speed of the slot in Half-Duplex is odd given their willingness to jump at any reason to publish a bigger number but I suspect changing their ways might result in some serious backlash as “its how they have done it for years”.